How badly do you have to go? 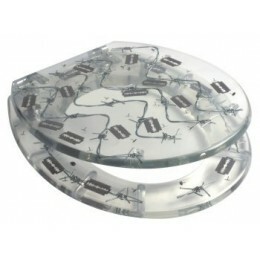 You might think twice about sitting down on a john if you see barbed wire, razorblades and tacks strewn about its surface, but not if that toilet seat is this comical Barbed Wire Resin piece from HomeZonePlus. This creative design is 100 per cent guaranteed to make guests roar with laughter. They'll do a double take before they realize just what the joke is all about, and if you listen hard enough, you're sure to hear them laughing while they use the facilities! You'll start conversations and raise more than a few eyebrows with this novelty toilet seat. Not just a humorous piece to horrify and then delight your friends, the Barbed Wire Resin Toilet Seat is well made and very functional. The hygienic finish keeps things sanitary in the bathroom, and the hinges are rustproof, even in bathrooms that lack ventilation and become very humid after a bath or shower. The toilet seat is a standard size and easy to install.